StockMarketEye allows you to set alerts on ticker symbols. 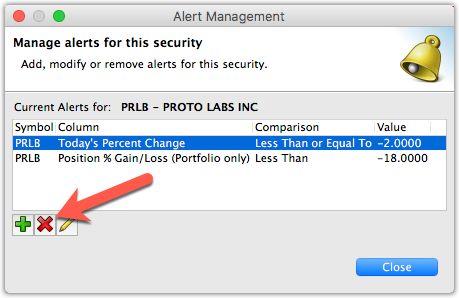 Currently you can set alerts on 8 different values of a ticker symbol such as Last Price, % Change or even P/E. Alerts are created for a ticker symbol. If you have the ticker symbol in more than one location (such as in 2 portfolios or in 1 portfolio and a watchlist), the alert applies to the ticker symbol in every location. This helps you stay notified of what’s happening even if you are not focused on one location. You can create any number of alerts for a ticker symbol. For example, you can create one alert for when the price goes above a certain value and another for when the price goes below a different value. 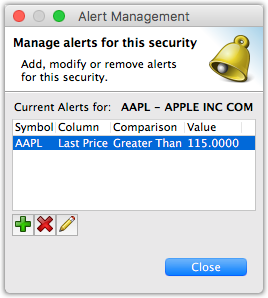 To create an alert, first select the ticker symbol for which you want to set the alert, then click on the “Alerts” button in the toolbar. You’ll now see the “Alert Management” window. If you do not yet have any alerts set for this symbol, you will get an empty window as seen below. Click on the green plus symbol to create a new alert. In the new “Configure Alert” window, you specify the various settings for the alert. The “Symbol” is the ticker symbol you selected. The alert will be set on this ticker symbol globally (i.e. in all portfolios and watchlists) in StockMarketEye. In the “Column” dropdown you choose the column on which want to set an alert. In the “Comparison” dropdown you choose how you want to compare the current value from the selected “Column”. In the “Value” dropdown you choose the value at which the alert should be triggered. When you are done setting the values of the alert, click on the “OK” button to add the alert to the “Alert Management” window. 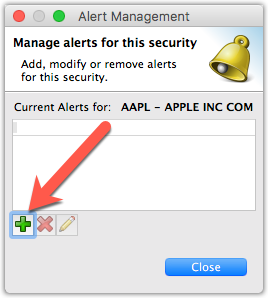 Then click on the “OK” button in the “Alert Management” window to activate the alerts for this ticker symbol. When there is an alert set for a ticker symbol, a blue bell will be shown in the left-most column. When the alert has triggered, an orange bell will be shown in the left-most column and the line will have an orange background. 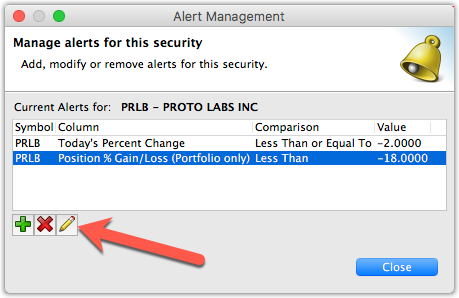 To modify an alert, first select the ticker symbol with the alert you want to modify, then click on the “Alerts” button in the toolbar. You’ll now see the “Alerts Management” window with the currently set alerts for this symbol. Select the alert you want to modify and then click on the pencil button, or double-click on the alert you want to modify. Now in the “Configure Alert” window, you can change the values as desired. When you are done, click on the “OK” button to close the “Configure Alert” window and then click on the “OK” button in the “Alerts Management” window to active the alerts for this ticker symbol. To delete an alert, first select the ticker symbol with the alert you want to delete, then click on the “Alerts” button in the toolbar. Select the alert you want to delete and then click on the X button. Finally, click on the “OK” button in the “Alerts Management” window to activate the change.